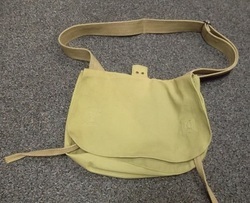 Reproduction of the World War Two Japanese equipment belt and ammo pouches. Includes bayonet frog. Great to complete that original tunic until a original hat comes along. Nice reproduction of the WWII Japanese field cap with neck shade. Replica Japanese WWII bayonet, scabbard and leather frog. A good reproduction for the re-enactor. A very good reproduction, again great for re-enacting or display.